So as you all know I mainly cover everything related to Beauty, Travel and Lifestyle on my blog and don’t often touch on what’s available for the amazing Men in our lives. I’m going to be covering much more about Men’s Beauty, Fashion and Lifestyle. So lets start with probably the best Barber Shop in Dubai! Most of you probably already know my husband Bobby from my Snapchat (Nina_Ubhi). Well he has his hair cut fortnightly at Chaps & Co by their barber; Jay and seems to be there for what seems like all day but comes back looking very sharp! So I decided to go with him to his fortnightly appointment and see what all the fuss is about. Chaps & Co is a typically dapper British Barber Shop with a charismatic trendy twist. I loved how they had ‘Chaps & Co’ in bright lights within the shop giving a hint of Hollywood to it! The Barbers in Chaps & Co all look uniformly sharp in black cigarette pants, white shirt and braces (think Mad Men). As well as an impressive shop front and plush interior they also a sofa area where the guys can chill with tea/coffee and play Playstation while they wait! 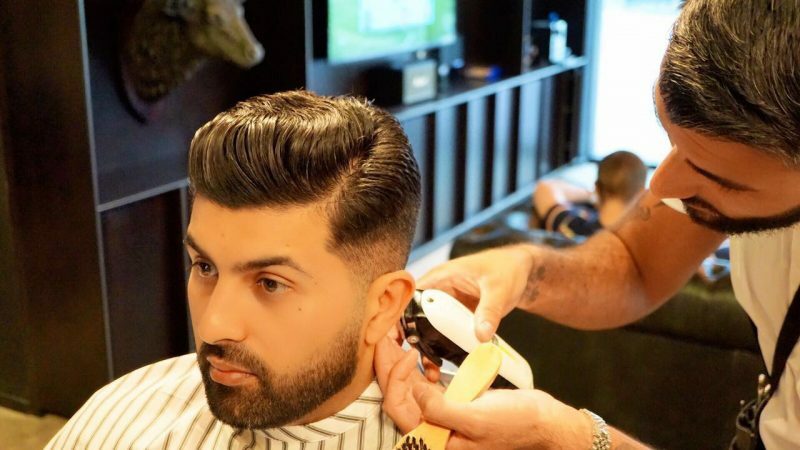 If you want the Man in your life to have the best fade in Dubai then visit Chaps & Co!